Is this genius or gobbledygook? It’s hard to tell. And most of the works—-all of them abstractions, by four different artists—-don't offer much help in sorting it out. Ashlynn Browning’s paintings reference architecture, though with a crumpled, skewed perspective that doesn’t look the least bit structurally sound. Unlike Browning, whose paintings use a muted palette, Deborah Zlotsky uses buoyant shades of fluorescent orange, peach and lemon (above). 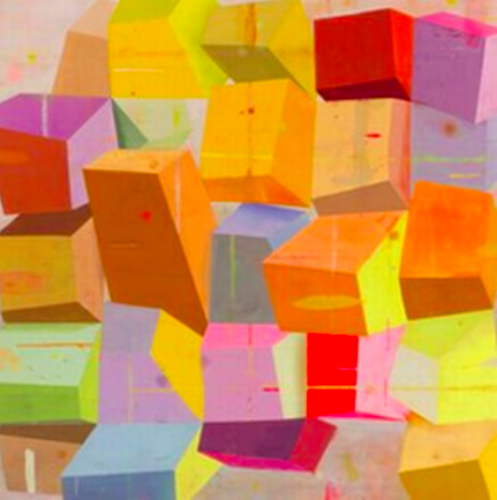 Her paintings are flat, two-dimensional agglomerations of box shapes (and the occasional form that suggests either a woven basket or a hand grenade). Amber Robles-Gordon, by contrast, takes three-dimensionality to its extreme, with imposing wall-mounted sculptures made from chicken wire, ribbons, discarded waterbottles, and other gewgaws (left). Intentional or not, the works suggest those impromptu memorials that spring up after tragedies. The clear standout, though—-with, alas, only one work in the show—is Mariella Bisson. She contributed the 34” x 74” “Falls Creek Panorama,” a landscape with a somewhat rubbery surface. The impressive thing about “Falls Creek Panorama” is that, from a distance, it genuinely suggests a landscape (a notch less representational than, say, Paul Cezanne used in his late Aix-en-Provence works), yet viewed close up, it’s as abstract as any Ab-Ex canvas. If you’re looking to reconcile representation and abstraction, as the exhibit appears to want to do, then Bisson’s bravura canvas is about as appropriate a bridge as can be imagined.